Preheat the oven to 350° F. Line the bottom of a standard-sized loaf pan with parchment paper – grease and flour the pan. In a bowl, sift together the flour, baking powder and salt. In a separate bowl, whisk together the yogurt, 1 cup sugar, the eggs, lemon zest and vanilla. Slowly whisk the dry ingredients into the wet ingredients. With a rubber spatula, fold the vegetable oil into the batter, making sure it’s all incorporated. Pour the batter into the prepared pan and bake for about 50 minutes – until a cake tester placed in the center of the loaf comes out clean. Cook the 1/3 cup lemon juice and remaining 1/3 cup sugar in a small pan until the sugar dissolves and the mixture is clear – set aside. When the cake is done, allow it to cool in the pan for 10 minutes. Carefully place on a baking rack over a sheet pan. 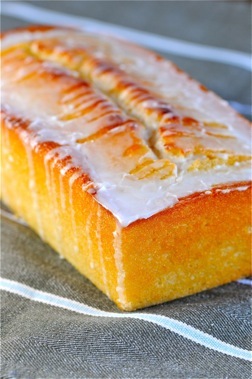 While the cake is still warm, pour the lemon-sugar mixture over the cake and allow it to soak in. Cool the cake.